Net Entertainment (NetEnt) games are now available at BitCasino.io much to the excitement of hundreds of bitcoin casino players. In fact, gamblers were waiting for NetEnt games to arrive into the BitCasino.io portfolio. BitCasino already had as many as 600 online casino games released by a wide range of providers, but now, it has over 150 more games from the NetEnt portfolio. Many of these games are available in the fun as well as BTC modes, giving new players a chance to learn the game rules for free before they decide to play for bitcoins. Bitcoin players can now access the most popular NetEnt slots such as Starburst, Blood Suckers, Fruit Shop, Twin Spin, and Gonzo’s Quest. For example, Fruit Shop is a delicious fruit-themed, five-reel, 15-line online video slot that offers free spins with doubled wins. If players land the wild icon during the free spins, their winnings will be multiplied x4 their bet amounts. And everybody loves Gonzo’s Quest, a slot that can transport players to Eldorado so that they can join Gonzo in his quest for wealth. The slot comes with the avalanche feature, enabling players to win incredibly large jackpots. Whenever players hit a winning combination, the symbols in that combination vanish and more symbols will fall from above to fill the spaces created. This leads to more winning combinations, more avalanches, and more prizes. Bitstarz is yet another online bitcoin casino that offers games from a wide range of providers such as SoftSwiss, Amatic, Microgaming, and Ezugi. Recently, BitStarz included NetEnt games into its portfolio. Bitstarz, however, is not a bitcoin-only casino as it allows players to fund their accounts using methods such as credit cards, LavaPay, Cubits, PaySafeCard, Skrill, Ukash, Neteller, and Wirecard. This partnership allows Bitstarz to include over 100 games to its existing portfolio of over 550 games. The portfolio now contains exciting titles from Quickfire, Ezugi, Amatic, and NetEnt. Previously mentioned slots such as Gonzo’s Quest, Blood Suckers, Starburst, and Jack Hammer are also available at Bitstarz. 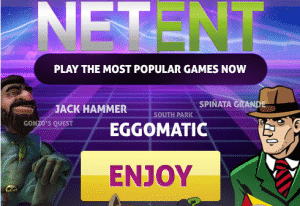 The introduction of NetEnt games to the portfolios of Bitcasino.io and BitStarz is sure to enhance the popularity of bitcoin online casino gaming. Traffic volume to both sites is sure to double thanks to their partnership deal with FENgaming, enabling them to compete effectively.